Arthur William Cooper (# 4 in the list of senior men to represent Great Britain) was born in Hendon, London on 11th May 1911, just a stones throw away from what was to become the Cricklewood rink, home to the soon to be hugely successful Broadway club throughout the 1930's, '40's and '50's. It is not certain what drew Cooper to become a speed skater, but it is most likely that as with many other youngsters at that time, skating was a welcome distraction for families who had endured the horror of what had been the First World War. As a youngster, Cooper joined the Broadway club (previously known as Cricklewood up until the late 1920's) and was rubbing shoulders with the likes of R.A.Symondson, the club's first British Champion in 1926 and Harold Wilkinson, British Mile Champion in 1931. Cooper and Wilkinson hit it off almost immediately and it wasn't long before the duo were making a significant impact on British speed skating. 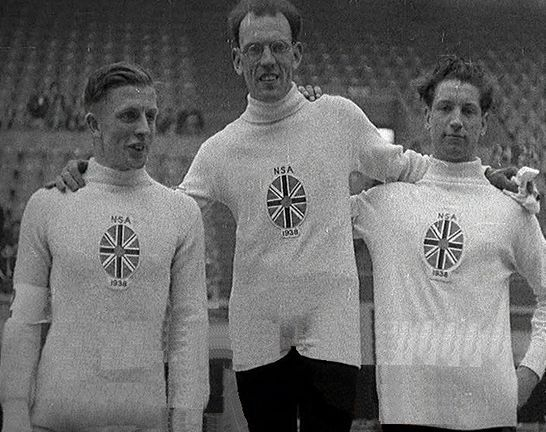 In 1936 Cooper won his first major gold medal, when alongside Wilkinson and his other two team mates Eddie Cleaver and Len Savage, Broadway were victorious in the British Relay Championship. It was 14th February and not only was this Broadway's first win in this most prestigious event but it ended the strangle hold that rival London club, Alexandra Palace, had on the event since 1930. What made the victory even more sweeter was that it was on Palace's own track. 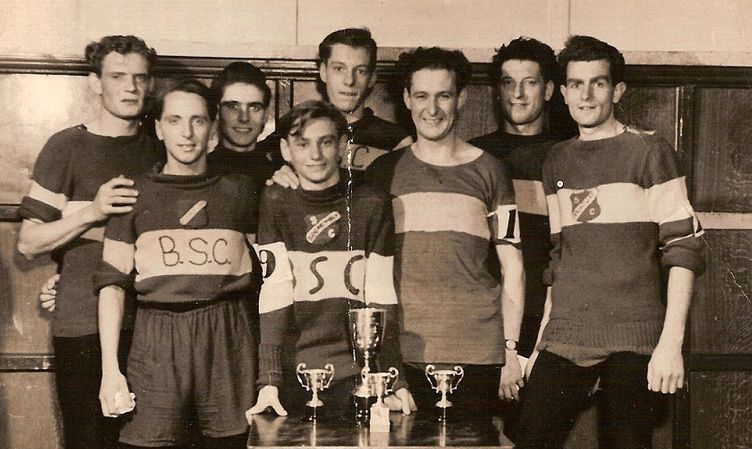 Later that year two members of the Alexandra Palace club would go and win European gold medals in Stuttgart, Germany, such was their class, but for now it was Broadway who were celebrating. For some time it had been known that Great Britain would play host to the first ever World Championships on the track for roller speed skating in April 1938. There had been European Championships in Belgium, Italy and Germany and Italy had also played host to the first ever World Championships, albeit on the road, in Monza in 1937. But now Great Britain wanted to get in on the act and selected an exhibition hall in Wembley as the venue. Throughout 1937 Cooper continued to impress and joining the Broadway club was another youngster, Jackie Robbins, who was taking British skating by storm. Early in 1938 Cooper won his first individual British Championship medal, silver, behind team mate Robbins in the One Mile. Britain had only ever sent representation to the European track championships in Stuttgart, prior to this event - and had come away as the most successful nation securing no fewer than six of the eight titles on offer. Cooper's club mate, Harold Wilkinson took two of these titles, the 1500 metres and 2000 metres. Cooper himself was not selected in 1936 but he was adamant that his name would be on the team sheet for Wembley. Despite not yet having won a national title, Cooper had impressed enough throughout the 1937-38 domestic season that when selection was made for the 1938 World Championships he was one of the three skaters to make up the British team. The team consisted of Cooper, Harold Wilkinson and Alexandra Palace's Bill Ross, himself a European Champion in 1936. At the opening ceremony Cooper was given the additional accolade of carrying the British flag. The 1938 World Championships was a roaring success for Great Britain. Not only was it the very first World Championships to be held on a track but Great Britain would go on and win no fewer than four of the six World titles up for grabs. Wilkinson was victorious in the 500 metres whilst Ross would go on and win the 5000 metres and 10000 metres, but the most notable victory was that of Cooper's in the 20000 metres. 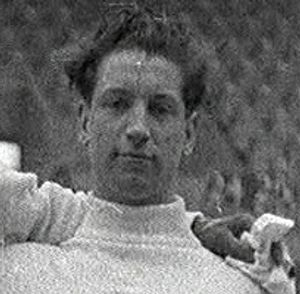 Wilkinson was a multiple British Champion, and whilst Ross was still to win an individual national title he was a seasoned speed skater who had amassed a huge collection of individual British Championship medals as well as a number of British relay titles to his credit, not to mention a European title. In contrast, Arthur Cooper had just one individual British Championship medal to his name and now, here he was, a bed spring manufacturer from London, just a few weeks shy of his 27th birthday and crowned Champion of the World! To prove this wasn't a fluke Cooper also placed in other events during the three days of competition. Cooper had shown that his place on the British team was fully deserved. On 23rd February 1939 Cooper capped a glorious skating career with an individual British title when he won the coveted Five Mile Championship on the Alexandra Palace rink ahead of Leicester's sprint king and reigning Half Mile Champion, Doug Jackson. Within months, however, Cooper's world, and that of many others, was turned upside down as Hitler rampaged through Eastern Europe and Britain decided that enough was enough. The advent of the Second World War put paid to any thoughts Cooper, or indeed any other skater, had of realising any more athletic dreams. For now, at least, the skating world stood still. Throughout the war Cooper worked as a fire warden, doing his bit for the war effort. The conflict would have a profound effect on many and very few were left unscathed. Whilst Cooper, himself, would emerge safe and well after fighting ceased, the same could not be said for his friend and club mate Jackie Robbins. Robbins, a skater of immense talent, was shot down and killed somewhere over Iceland, barely out of his teens. Skating in Britain resumed almost immediately after the war and by 1948 major international championships had resumed. Cooper, however, had his best years behind him. Now aged 37, his Broadway club now had other young stars in the wings. The likes of Don Brown and Denis Hill were setting the British skating world alight. But in 1948 Cooper took part in an event that was to cause such controversy that would see the whole of the Broadway club banned from British competition for a full 12 months. Those competitions held under the banner of NSA (National Skating Association) events, that is. The reason for this somewhat draconian punishment was that Broadway skaters had taken part in both "unofficial" British and World Championship events, not sanctioned by either the NSA or the world governing body, FIRS. Cooper himself was not selected to represent Britain at the "World Championships", held in Oakland, California, but some of his team mates were - the likes of Frank Lamb (reigning NSA One Mile Champion) and Geoff Sanders (reigning NSA Half Mile Champion). Both Lamb and Sanders won medals at these Championships, with Lamb taking the gold medal in the 2 Mile event. The events came about because the Cricklewood Rink and Birmingham (Embassy) Rink were owned by the same company who were themselves members of the RSROA (Roller Skating Rink Operators Association). These British rink operators were allied with similar operators in the United States, Canada, New Zealand and India. The British contingent also had their own governing body, the BFARS (British Federation of Amateur Roller Skaters). Taking part in events organised by these "governing bodies" was obviously frowned upon by the NSA and FIRS, and subsequent bans were handed out. This meant that in 1948 no Broadway or Birmingham skaters were allowed to compete in that year's "official" British Championships, and nor was any skater eligible for selection with the "official" British team. This of course included Cooper. It is uncertain if this sounded Cooper's death knell with regards to speed skating competitions, but it is clear that soon after he retired from racing. He continued to stay in touch with his skating pals initially, but the closure of the Cricklewood rink and a move to Slough for Cooper in 1954 meant that even this would slowly diminish. Cooper was recognised by the Queen in 1979 at a centenary dinner held in honour of the National Skating Association for which Her Royal Majesty was the patron. All World Champions from all skating disciplines, both ice and roller, were formally rewarded with a medal in recognition of their achievements. One of the last times Cooper was seen at a race meeting was around 1980 when together with his family he went and watched an event held at Southsea near Portsmouth. It is likely that very few people present that day would have recognised Cooper or indeed understood what an important part he had played in cementing the future of British skating. Arthur Cooper sadly passed away in Bracknell in July 1990. Having been crowned a British Champion and one of the very first World Champions he was part of a generation that inspired future British skaters to emulate his achievements, but not until 1963 would Britain once more enjoy golden success on the world stage. Of the many hundreds of British skaters that have ever graced a track or indeed those who have represented Great Britain on the biggest stage, Arthur Cooper remains as one of just six who can lay claim to having achieved the biggest prize of all - to be crowned World Champion, and if for nothing else, it is for that reason he will always be recognised as a British Skating Legend.